Connect splice boxes to fiber processing equipment. 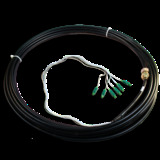 These Service Cables are designed for CATV boxes with 5/8" thread. We will connectorize to your specifications.